Pho Hung Vuong | ohdenny. Pho Hung Vuong has been around ever since I can remember. Located in Springvale, the South East’s bustling Vietnamese community, has one of the most popular Vietnamese restaurants in Victoria. Not only is it always packed full of people, but is well known for its delicious and authentic Pho. It used to have a few other restaurants, one on Victoria Street, Richmond, I think it’s called Pho Hung Vuong 2 (Original!) but I’m not too sure if there are owned by the same people. Pho Hung Vuong doesn’t go out of its way to impress you, the place looks like it hasn’t been maintained since the shopping centre opened way back when. Although it’s not the most pleasant experience, the food does more than make up for it. 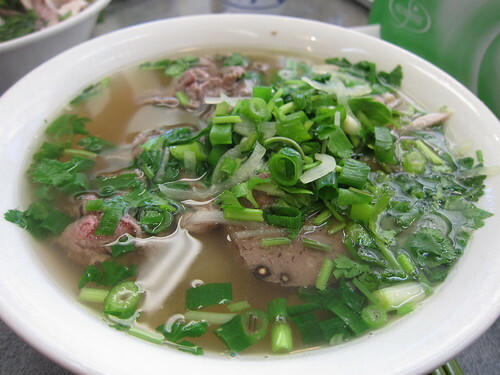 Everybody that visits Pho Hung Vuong comes for their famous Pho. In three different sizes, like most Pho eateries, small, medium and large, with your choice of chicken, beef, mixed or even with added sausage. There are quite a few other ingredients you can add to your order but the above mentioned ones are the most popular. What makes their Pho so good is the soup. It is packed full of flavour, I don’t know if it’s also packed full of MSG (Probably) but it is one of the best tasting soups around so it’s hard to make a fuss about it. The chicken/beef are perfectly cooked, with the beef gently cooking in the hot soup while you eat. It’s tender and delicious, what more could you ask for. Of course they just don’t serve Pho, as it is a Vietnamese restaurant you can get the Fried Pork/Chicken dishes with Vietnamese salad/vegetables and rice, and all the other standards you would normally find in a Vietnamese eatery. My lack of discussion over their other food isn’t meant to be an indication of the quality of their other dishes. It’s by all means quite good. It’s just when you come to Pho Hung Vuong, you definitely come for the Pho. You really would be hard pressed to find a better Pho restaurant in Victoria.